It can be awkward, to say the least. But even thinking of our own awkwardness feels selfish, given the contrast. Your co-worker just lost her husband to cancer; your friend’s mother suddenly died in a car accident; your grandfather died, leaving your grandmother a widow. What do you say? What do you do? We often want to fill the silence with comforting words which somehow feel hollow. Maybe it’s easier to simply avoid. For those of us who have yet to experience such loss as closely as others, it can be difficult to navigate. How do I help? Does it bring up the pain if I offer? Should I pretend like nothing happened or do I acknowledge it? Will that just make things harder? So all to often, it feels easiest to just stay away. In his beautiful work “A Grief Observed”, C.S. Lewis (Clive) describes how some friends and acquaintances avoided him after the loss of his wife. It’s tempting to think they were just uncaring and selfish, and so they may have been. But if we don’t understand how to be supportive, is it better to avoid interaction than risk doing more damage by engaging? We don’t often think about how to confront grief with others until we’re there, sometimes leaving with one foot in our mouths or our minds full of doubt. This past year, my sister tragically lost her baby (Clive) after just having announced his coming to the world. After talking with her I had that struggle of knowing whether I’d said the right things, said anything stupid, and whether it was okay that, after listening and crying with her, we ended up talking about random silly nothings. Looking back, I realize (and hope) I gave her the only things I had. I gave her my ear, my love, and I hurt with her. And that’s the beautiful thing about the way their family is processing their grief (though everyone will process differently). They do so openly, not avoiding it, and with their four other children, they grieve together. 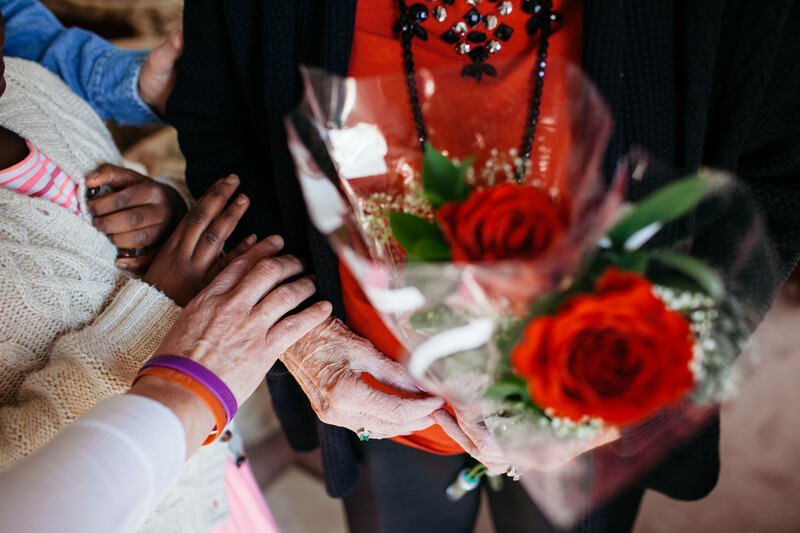 A Widow Wednesday team prays with a local widow after delivering roses for Valentine’s Day 2016. Approaching the epicenter of another’s grief is intimidating. But still we must approach. What we all need most in times of suffering is compassion or “suffering with”. We don’t so much need words, though occasionally they can be comforting. We don’t primarily need practical assistance, though often it is necessary. We need each other. We need to know we’re not alone. The Lord has made us not only to rejoice and celebrate together, but so much as well to grieve and hurt together. Look at the root of words like community (unity with), compassion (hurt with), comfort (strengthen with). All of these are done together. We’re never meant to do this alone. This is the real work of Widow Wednesday. Our tagline is “connecting every widow to someone who cares.” Practical matters are not the focus, so much as the need to grieve and move forward through joy and pain together. 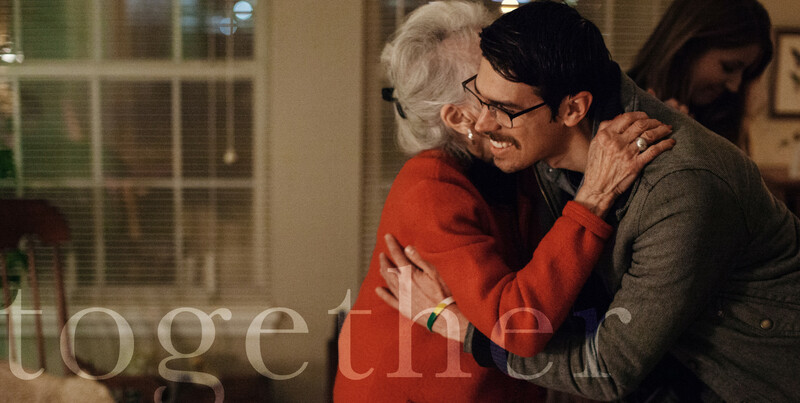 That is our desire, to join with widows in all stages of grief, new or mature, and hurt together, move forward together. Sometimes that’s as simple as raking a yard. Sometimes it’s listening to stories. Whatever it becomes, it’s showing the same care for all, suffering and rejoicing, together. We are working to train, support, and connect non-widows with widows, building compassionate community in our city. But we cannot do this work without loving people giving of their time and resources. If you’d like to join us consider giving here, and sign up for our volunteer list here. We’re so sorry for your loss Patti. But we certainly are glad to hear the little we’re able to do is a help. Many blessings to you!